63 www.hplusmagazine.com We talked on the phone, eventually, after a problem with timezones, and I remarked to her that one of the problems with living forever, considering the delicate transfer of selfhood into electronic media, was the sheer problem of human error and computer glitches. Martine responded: "There will always be error – it's part of the human condition. In the flesh, people have odd experiences with their own biochemistry that make them who they are: somatically induced or inherited. Yet those errors don't prevent people forming relationships. Uploading will have its errors — manageable errors — and that is part of one of the things that will keep the uploaded human." Won't the difference between sensations experienced in the flesh and sensations experienced or remembered when you are uploaded be like the difference between analog and digital recording? "It will be different, and some people will notice the difference — just as some people prefer the mellow sound of analog and some people actually prefer the crisp artificial sound of digital. But here's the thing. Both are better than being dead and never hearing anything again, ever." I wondered: Would it be a nuisance never being able to forget anything, not being able to be disconcerted again by twists in the plots of books you re-read, not being able to get the surprise in Haydn's Surprise symphony? "That's an assumption," Martine said, "but actually the mindware that will be approved for use will have as one of its features a graduation of memory strength. Things can be artificially forgotten. Some things — like your name and where you are at the moment will always be front and center. Other things will not always be recalled and some things will be completely forgotten. Mindware will allow you to adjust the accessibility of what you need to know, when you need to know it. Not forgetting wouldn't be a user option that we would choose, even with bad experiences. You need the bad things as a spur, but they need to fade to grey. And you can arrange your mindware to do that for you." I asked Rothblatt at what point in their lives people would choose to upload. "It's not a one-size-fits-all thing. Some people would use uploading just for storage. Other people would want to stay digital. Some people would want to move back and forth. The first person to visit Mercury will do so uploaded into hardware that can survive that environment. Some people would use it to do certain things and then return to the flesh, It isn't necessarily an all or nothing thing. And that's one of the things that demonstrates the humanity of the whole project." 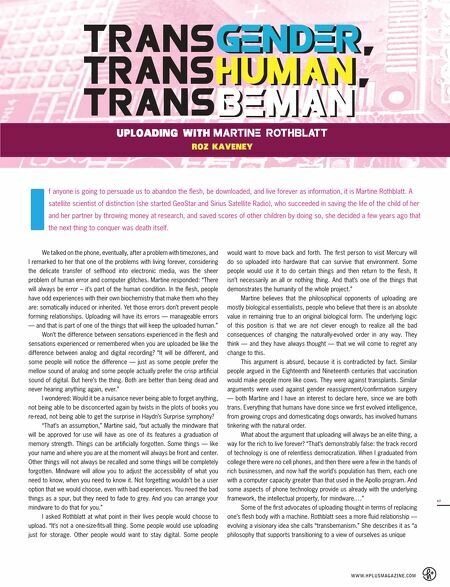 Martine believes that the philosophical opponents of uploading are mostly biological essentialists, people who believe that there is an absolute value in remaining true to an original biological form. The underlying logic of this position is that we are not clever enough to realize all the bad consequences of changing the naturally-evolved order in any way. They think — and they have always thought — that we will come to regret any change to this. This argument is absurd, because it is contradicted by fact. Similar people argued in the Eighteenth and Nineteenth centuries that vaccination would make people more like cows. They were against transplants. Similar arguments were used against gender reassignment/confirmation surgery — both Martine and I have an interest to declare here, since we are both trans. Everything that humans have done since we first evolved intelligence, from growing crops and domesticating dogs onwards, has involved humans tinkering with the natural order. What about the argument that uploading will always be an elite thing, a way for the rich to live forever? "That's demonstrably false: the track record of technology is one of relentless democratization. When I graduated from college there were no cell phones, and then there were a few in the hands of rich businessmen, and now half the world's population has them, each one with a computer capacity greater than that used in the Apollo program. 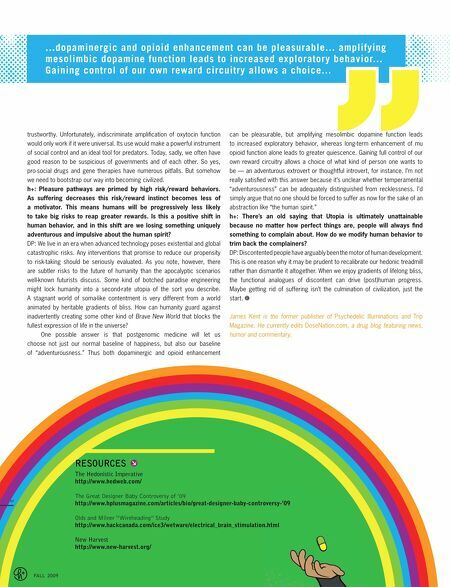 And some aspects of phone technology provide us already with the underlying framework, the intellectual property, for mindware.…" Some of the first advocates of uploading thought in terms of replacing one's flesh body with a machine. Rothblatt sees a more fluid relationship — evolving a visionary idea she calls "transbemanism." She describes it as "a philosophy that supports transitioning to a view of ourselves as unique I f anyone is going to persuade us to abandon the flesh, be downloaded, and live forever as information, it is Martine Rothblatt. A satellite scientist of distinction (she started GeoStar and Sirius Satellite Radio), who succeeded in saving the life of the child of her and her partner by throwing money at research, and saved scores of other children by doing so, she decided a few years ago that the next thing to conquer was death itself.